6.Basic feather stitch and inverted feather stitch are alternated in the first row, instead of working the feather stitches horizontally, they are worked at an angle in the second row. 7.Dark pink rimjim threads are used to lace and whip these inverted feather stitch rows. 8.The inverted feather stitches are worked angling towards the left in the first row, this is done by working the inverted feather stitches shorter than the feather stitches. In the second row, the feather stitches are worked shorter and the inverted feather stitches are longer, this angles the stitches to the right side. This row seems interesting. 9.I worked two inverted feather stitches into each feather stitch in the first row. After working feather stitch, inverted feather stitches are worked with a different thread in the second row. This is the second stitch of the TAST 2013 challenge by SharonB. I have never seen or heard of this stitch before. It was really hard to get the direction and the tension of the thread. I had similar problem with open chain stitch, which I have stopped learning! This time there was no such excuse, because the idea to join this challenge was to learn, practice, work samples of the stitches that are part of the challenge. 2.I got bored with my attempts and started some variations, in the first row, the alternate inverted feather is taken longer the basic inverted feather stitches. The long and shorter version of inverted feather stitches are worked in the second row. 3.I widened the inverted feather stitches in the first row, and worked wide and narrow inverted feather stitches in the second row. 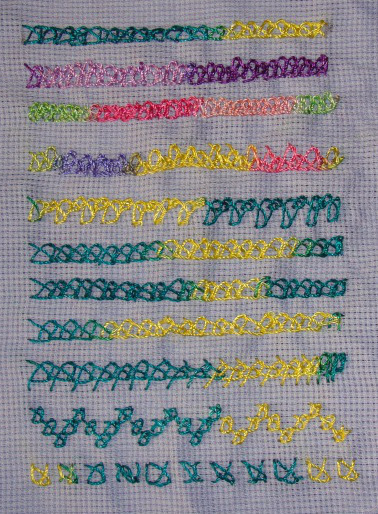 At this stage , I don’t care the stitch samples look untidy, just happy to work on this stitch. 4.In the first row, the inverted feather stitches are worked from the midpoint of the basic feather stitch, in this variation, the inverted feather stitches look like loose chains. In the second row, the inverted feather stitches are extended over the feather stitches. 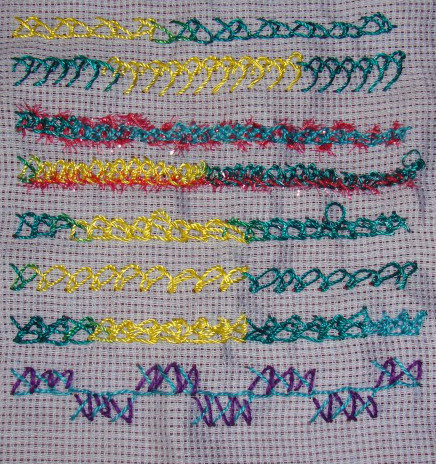 5.I tried working individual inverted feather stitches in step and vertical [messy] inverted feather stitches in a row.